We have all seen dolphins while crossing to The Sanctuary and in Sanctuary waters. What we may not have realised is that many were humpback dolphins which may be even rarer, in a world context, than dugong. While Australian dugong numbers are estimated to be around 80 000, they have less than 150 humpback dolphin. 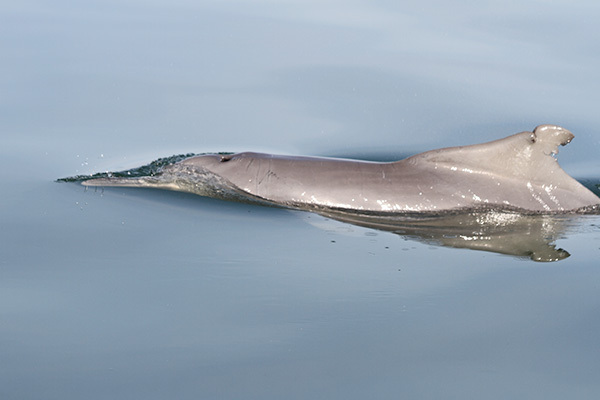 In a recent article a total of 105 humpback dolphins was estimated for all Mozambican waters. The Sanctuary may contain a substantial proportion of the Mozambican population of an important and endangered species. Numbers are declining in most areas and localised extinctions may soon occur. Humpback dolphins are, however, often and easily seen in our waters. They are an inshore, shallow water species, and some may be resident in or dependant on our waters supported by our marine protected areas. The greatest threats are habitant degradation and fishing bycatch mortality. Not only are The Sanctuary waters not degrading but we are closing some shallow inshore areas to fishing. What we now need to do, with the assistance of Owners and Visitors, is to try and find out more about our humpback dolphins. It is suspected that we have at least two resident families in our waters, and we need your help to get an estimate of numbers and distribution. Below is a photo taken by an Owner (Lynette Jackson) showing clearly a very obvious damage pattern on the animal’s dorsal fin; photos like these will assist us in identifying individual animals. We are building a database of photos of identified animals and location, ideally GPS coordinates. Any useful information would be appreciated. This is an endangered and charismatic icon of The Sanctuary waters and you can help us helpit.